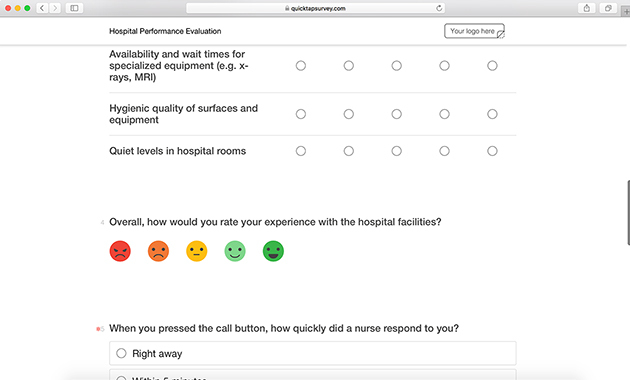 Prioritize improvements to your facility, administration, and communication practices with this thorough examination of the patient experience. 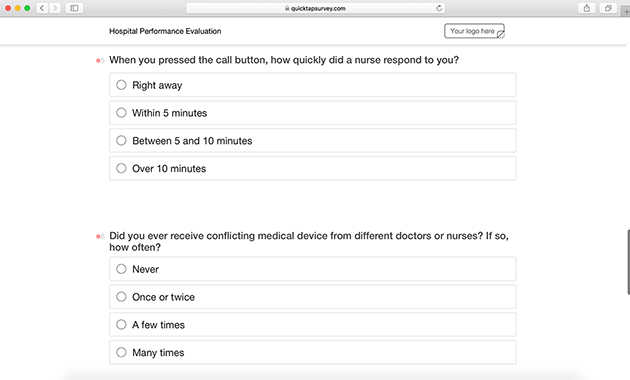 With QuickTapSurvey's fast and easy survey builder application, you can create beautiful face-to-face, kiosk, offline, and online surveys and forms. 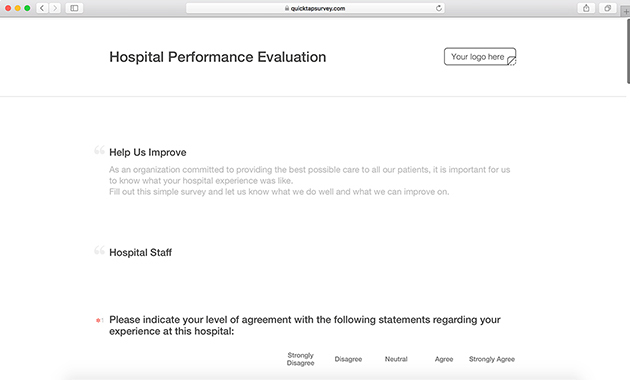 Use one of our templates or build your own survey or form from scratch using our easy survey builder tool. All you need to get started is to sign up for a free trial with QuickTapSurvey today and create your first survey! We offer a variety of plan levels and features to suit the needs of your organization, and we provide service to many clients in the healthcare industry. Please indicate your level of agreement with the following statements regarding your experience at this hospital: The staff was courteous and professional. The staff was responsive to my questions and concerns. It was easy to talk to the staff about my condition/symptoms. The staff explained treatments/medicine in a way I could understand before administering. 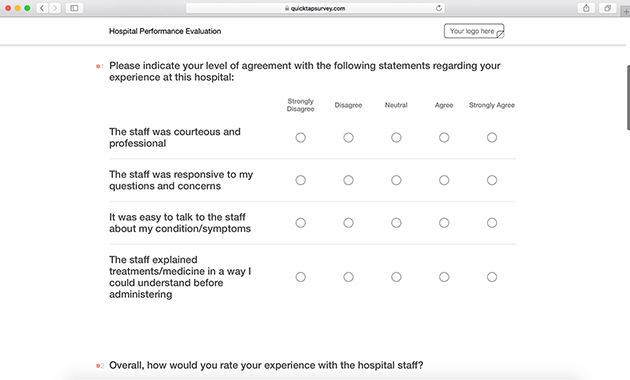 Overall, how would you rate your experience with the hospital staff? 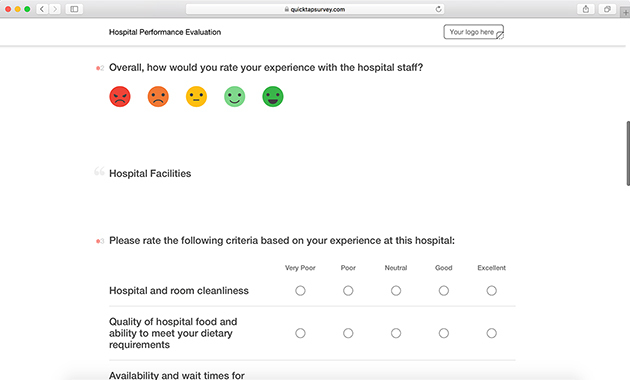 Please rate the following criteria based on your experience at this hospital: Hospital and room cleanliness. Quality of hospital food and ability to meet your dietary requirements. Availability and wait times for specialized equipment (e.g. x-rays, MRI). Hygienic quality of surfaces and equipment. Quiet levels in hospital rooms. 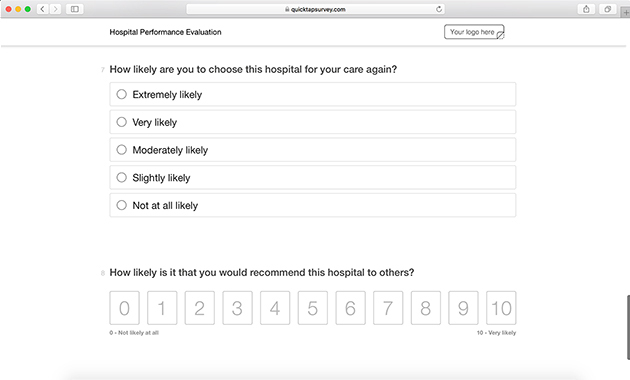 Overall, how would you rate your experience with the hospital facilities? When you pressed the call button, how quickly did a nurse respond to you? Did you ever receive conflicting medical advice from different doctors or nurses? If so, how often? How likely are you to choose this hospital for your care again? How likely is it that you would recommend this hospital to others? 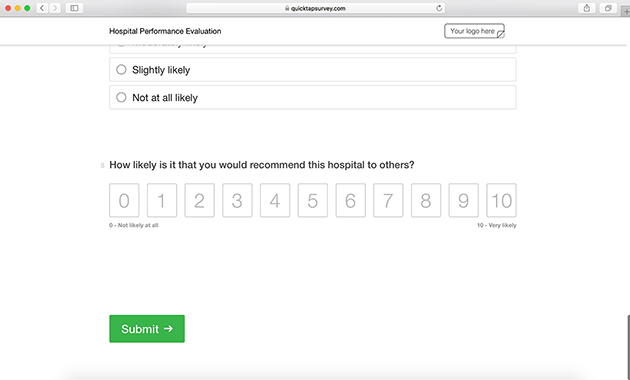 Start your free trial today, and gain access to your hospital patient satisfaction survey and all of our templates through the QuickTapSurvey app.